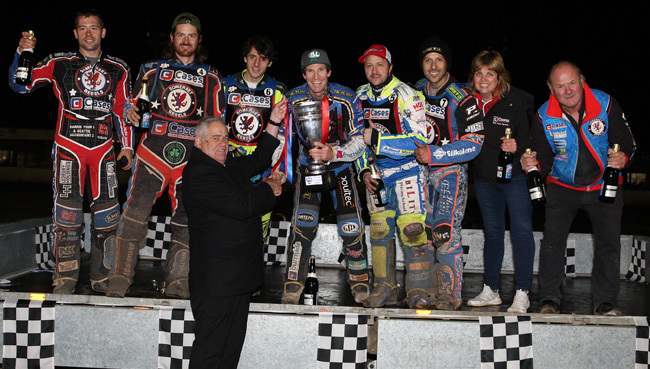 Somerset Rebels Speedway Official Website: WE'VE WON THE CUP! The 'Cases' Somerset Rebels reserve Nico Covatti recorded his second double figure in the final of the SGB Premiership Knockout Cup competition to give the club their first piece of silverware since stepping up to the top flight of British Speedway last year. At the Adrian Flux Arena, the Argentinian-born, Italian licenced 30 year old matched his first leg paid 15 score as the Rebels protected their 16 point advantage to secure the aggregate victory when Jason Doyle and Nico Covatti headed home Niels-Kristian Iversen and Simon Lambert in heat 11. The rampant Rebels spurred on by a determined Richard Lawson, had raced into a 16-8 second leg lead before the home side could celebrate a race winner. Lawson dropped a solitary point in his first three rides, that to Erik Riss in heat 8 as the Rebels inched ever closer to their aggregate target of 91 points. The excellent form from Covatti, who was joined in the reserves berth by his compatriot Fernando Coty Garcia, a late addition for the Rebels after Jake Allen had ruled himself out with a knee injury sustained on Wednesday night, ensured the Rebels maintained the momentum, offering the deflated Stars very few opportunities to turn the tie round. Whilst the fear was always there against the Stars' reputation for comebacks, as the heats were rapidly being checked off the cup dream was becoming ever more a reality and it was only after the job had been completed that the Rebels eased off the pressure and the Stars were able to close out their season by salvaging an on-the-night draw, denied a consolation victory when Rebels guest Chris Harris cleverly cut-back on Erik Riss to split the German Star from partner Robert Lambert . A jubilant Debbie Hancock hailed the night as "a truly great feeling and a perfect way to end the season. We can look back on the year and celebrate what has been quite successful with us reaching the play-offs and only losing out in the 30th heat of the semi-final and then winning this cup having beaten the three clubs that, alongside us, reached those play-offs.". The Rebels will be parading the trophy at their End of Season Presentation evening on Friday 2nd November, an event to which Charles Wright and Paul Starke have both been invited to attend.